New Discovery - Fit and Healthy for Life! It’s never too late to change unhealthy habits. With the proper attitude we can find exercise fun and rewarding. With a healthy outlook on life, we can enjoy good nutrition and pass on the fast foods and fattening sweets. With an optimistic attitude we have every right to expect a long healthy life full of smiles and laughter. With an attitude of respect and love toward ourselves, we find our body remains young, fit and healthy! This set is valued at over $250, but for a limited time you can get a copy for only $79! Also, as part of this special offer you will receive access to hundreds of dollars worth of bonus gifts from numerous sponsors of this program – including one from me! 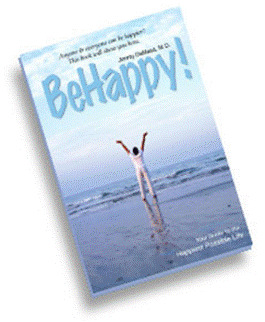 BE ON THE LOOKOUT: Starting with the August issue of The BeHappy! Newsletter we'll begin a 6-month "relationship" series designed to improve your relationships significantly. Or, if you're looking for that "right relationship", this series will help with that, too. So look out for the start of this series starting with the August edition. Every year your body replaces 98% of your atoms. Every cigarette smoked cuts at least five minutes of life on average. The last edition of The BeHappy! Newsletter in April summarized all the components of our year-long, 7-part series designed to provide a “simple formula” for happiness. I hope you got a lot out of the series and are living happier and more grateful now. 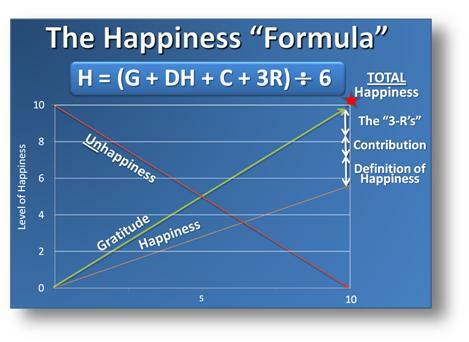 This series outlined a complete "formula" for creating a happy life, which is summarized in the graph to the right. It's really a simple formula anyone can use to create a happier life, but simple does not necessarily mean it is easy to achieve. It takes an understanding of the components of the formula and an action plan to address each of those components in your own life. And, if you haven't had the opportunity to go through the BeHappy! 7-part series, this graph probably doesn't make perfect sense to you. For those of you who have been a subscriber to this newsletter for the past year, however, did you read each part of the series and do the exercises described in each issue? If so, I’m sure you can understand the graph - but more importantly, you likely have a much different perspective on life today as compared to a year ago. I am confident you are happier, more content, and more grateful than you were this time last year. It's almost impossible not to be if you implement the formula. For those who are new subscribers, or who just didn’t take the actions recommended, take the time to go back and do it now. Trust me, it will have a very positive effect on your life. You can read the introduction (February 2011) by clicking here, the first step (May 2011) by clicking here, the August issue by clicking here, the October edition by clicking here, the December edition by clicking here, the February 2012 edition by clicking here and the conclusion (April) by clicking here. Go through each of these editions of the newsletter, take the actions recommended, and - even though it will take time and effort - I am sure you'll be happy you did. Evidence continues to grow regarding the link between our health and how we think. Specifically, it is becoming increasingly clear that our attitude, beliefs, and outlook on life can influence our chances of getting certain diseases and even how long we live. This all relates to happiness in many ways. First, it might be obvious that being healthy can lead to more happiness, but we all know many people who are perfectly healthy (physically) but are still not very happy. That is sadly quite common. On the other end of the spectrum, as indicated above, happy people are generally healthier than unhappy people – and live an average of 9 years longer based on some studies. So, for this edition of the newsletter, we'll be touching on some of the basic elements of health and happiness, along with some recommendations and actions to take that will help you live better and longer, with more energy and vitality. While our minds have a very powerful influence over our health and lifespan, it surely takes more than just "being happy" to stay healthy and live longer. In addition to the strong and growing evidence that attitude and optimism can influence health and longevity, there is also solid evidence that nutrition has a significant influence as well. Conceptually, most people know that. The issue is that some of the information and beliefs we have about what is "good" nutrition had may not be totally accurate. Cancer, for example, continues to be a major cause of death (perhaps even increasing in frequency) – especially in advance societies where food is highly processed with less than ideal nutritional value. Heart disease, another all too common issue, can be directly related to our diet and exercise habits. In 2008, more than 1.4 billion adults, 20 and older, were overweight. Of these over 200 million men and nearly 300 million women were obese. 65% of the world's population live in countries where overweight and obesity kills more people than underweight. More than 40 million children under the age of five were overweight in 2010. For both of these conditions – cancer and heart disease – and several other common diseases, there appears to be a link with inflammation in the body, much of which can either be increased or decreased by the foods we eat. We may think eating that low cholesterol, low fat food is "healthy", but it may actually be unhealthy - and actually is increasing our chances of cancer or heart disease rather than decreasing it. In fact, it may be that high cholesterol is not the problem at all, but rather the inflammation in our system which causes that cholesterol to stick to our blood vessels and cause obstruction. One of the most common problems in society today is obesity. We all know that. In fact, there's a website (43Things.com) which lists the entire world's most popular goals, and the NUMBER 1 goal in the world is to "lose weight" (to "be happy" is the NUMBER 5 "most popular goal" in the world ... but when you think about it, most people want to lose weight "to be happy"). Well, it's beyond the scope of this edition of the newsletter to go into weight loss, but the bottom line is that if you can get to, and maintain, your ideal body weight in a healthy way, you will reduce disease, live longer, and be happier! If you want more information, just click here to get more information on healthy weight loss strategies. 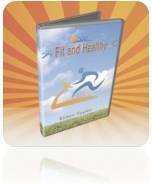 Here's a proven system used to help thousands of people lose weight (and fat) effectively. It's a system developed after years of research and is truly a breakthrough. Just click here to check it out. What age do you think you'll live to be? Most people who answer that question usually say somewhere between 65 and 75 years old. And so, they are usually right (unless something unforeseen happens before reaching that age, and they die younger). But what if you believed - really believed - that you would live to be 83, 92, or even 100 years old or more? Do you think it would make a difference? Here's a hint - the answer is most likely "yes". Our beliefs can also create our reality - and it's a very powerful effect. If you believe, for example, you can ride a bike; you will likely ride a bike at some point. On the other hand, if you were to believe you can't ride a bike, then you probably won't. You probably wouldn't even try. On a bigger scale, if you believe you can become a Broadway actor, it's much more likely you will become one than if you believe you can't. Yes, beliefs can have profound effects on our lives - even the effect of extending it by 10, 20, even 30 years or more - if you believe it can happen. There are many reasons for this. It is beyond the scope of this newsletter to fully explain why, the bottom line is that it works - and there is a lot of evidence to prove it. The powerful book by Deepak Chopra called Ageless Body, Timeless Mind (Harmony Books, 1993) explains part of this concept. It is very compelling. In his book, he describes (and scientifically supports) how we basically "program" ourselves to make our bodies age more quickly than we should, get diseases at a certain age, and even die younger than we would normally die if we were instead to "program" ourselves differently (he says that biologically we should live to a healthy age of 125-140). If that sounds far-fetched to you, it's understandable. It is certainly not the norm. But what if it's true? Is it worth a try? How could it hurt to try? The worst case scenario is that you get ill and/or die at the same time you normally would if you didn't believe differently. The point of all this is simple. The mind and body are connected. Health and happiness are linked very closely. To be as healthy as possible, it is important to be happy. A positive, optimistic, grateful attitude helps us to be healthier – both directly and indirectly. Simultaneously, a healthier lifestyle (mainly through regular exercise and proper nutrition) can help us avoid stress, disease, and “unhappiness”. And, a different belief system can help us live well beyond the time we are currently "programmed" to die. So, jump on this healthy “cycle” of life by using the information available to educate yourself, be happier, prevent disease, live longer, look and feel better, and have more energy and vitality. And if you want more help, please go to BeHappy101.com, get the book, BeHappy!, or take advantage of my free coaching plan by clicking here and I'll help you personally to make happiness a "habit". So, now it’s time to take action toward addressing this issue of health for the next 60 days. Take these actions over the next sixty days and by the time you receive the next edition of the BeHappy! 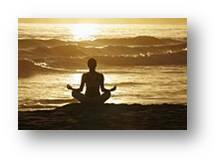 Newsletter (around mid-August), you should be on a path to better health, vitality, and energy. Start to believe, really believe, (even if you have to fake it at first) that you will live to be 90 or 100 (or whatever age you want). Pick a date when you will be at least that age, which you will make your "age goal". Let's say it's December 2nd of the year 2057 (yes, be specific). That's the day you will be "ready to go". It's important to think about that date regularly. Put it in your planner. Think about things you will want to be doing in the several years leading up to that date. When you make your goals - especially your 5-year, 10-year, and 20-year goals - make sure to also include goals for the 9th and 10th decades of your life. Do this for the next few years and your reality will change. You will start to believe - even to expect - to be alive in your 90's (and beyond, if that's what you want). Reduce your "age awareness" (or especially your "age focus", if that's more descriptive of how you think). This is usually a tougher thing to do. We are constantly reminded of our age. We celebrate birthdays every year. We are asked frequently our age (by friends, family, strangers, and even on various applications). We start getting told we're "getting old" at a certain age. We even say it to ourselves after a while. Stop doing this!! And do the best you can to have others stop doing it, too. To reprogram your mind - even a little - you must get away from thinking about your chronological age so much (the book Ageless Body, Timeless Mind discusses this in detail). Additionally, according to Chopra (the author), we even "believe ourselves" into getting certain diseases or ailments. If our parents had high blood pressure, for example, then subconsciously, we tend to believe we'll get high blood pressure, too, and it usually becomes reality (which as most people know, usually leads to an early death due to heart attach or stroke). So, it is possible we actually create disease in our body with our beliefs and "programming". Change that programming! Start now with these actions - including reading the book. Take care of yourself. Okay, so this is obvious. The truth is, though, if you do steps 1 and 2 - and everything else in the BeHappy! system, you will almost naturally and subconsciously do this, too. You will want to because you now have a more compelling reason to take better care of your mind and body. So exercise regularly. Eat well. Drink in moderation (or not at all if you prefer). And certainly don't smoke or take drugs. You should even start to take various health supplements, like OPC-3, multivitamins, and other neutraceuticals. Start something like this over the next few days. 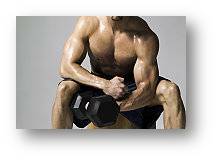 Begin an exercise program if you don't exercise regularly right now. Just start something. Take a 15-minute walk 3 times per week as a start. By the way, certainly no one would want to live to be 100 if their quality of life was poor. So, the assumption with this process is that you live to be a happy, healthy, vibrant, alert, active 80, 90, or 100 year old (not a debilitated, bedridden, sick old man or woman). Do the four things described above and you can live a much longer, healthier, and happier life than you would normally live. Yes, by doing this, you can add years - even decades - to your life. And even if you don't make it to 100, just living 10 years longer than your initial answer of 65 - 75 would be great, wouldn't it? Also, make sure to check out Eldon Taylor's new program described in the box at the beginning of the newsletter. It could change your life. Click here to check it out. A whole new structure will be coming to BeHappy101.com at the end of June (perhaps a bit later since I am waiting for the company who manages my website to make some major changes - which was supposed to happen by now, but is apparently taking much longer than they expected). Anyway, once the new structure is in place, there will be lots more free stuff, a simpler navigation system, and the introduction of many new products and services intended to help you live your happiest possible life.